^ Li Ka Wan. 派路：米蘭阻我加盟車路士. 歐洲聯賽冠軍盃 (Goal.com). 2012年11月19日 [2012-11-20]. ^ Chen Jin Ye. 肥安：AC米蘭不應放走派路. 意大利. http://www.goal.com. 2012年2月24日 [2012-12-29]. ^ 永明. 安察洛堤AC米蘭執教生涯回顧. AC米蘭 (新浪北京). 2009-06-01 [2012-11-16]. ^ 定春. 安察洛堤八年功過今予評說 他已成為AC米蘭歷史一部分. AC米蘭 (新浪北京). 2009-06-01 [2012-11-16]. 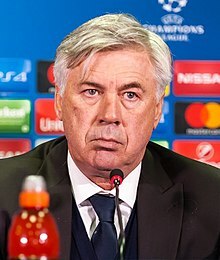 ^ Ancelotti appointed Chelsea boss. BBC Sport. 2009-06-01 [2009-06-02] （英语）. ^ Official Announcement. Real Madrid Official website. 2013-06-25 [2013-06-25] （英语）.